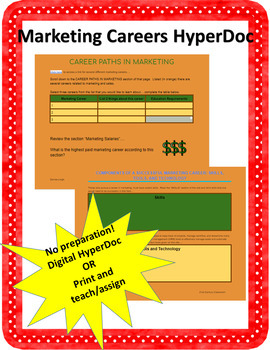 Marketing Careers-HyperDoc or print! NO PREP! NO PREPARATION! I'm happy to pass this marketing career discovery activity on to fellow business educators! This activity is a GREAT way to introduce students to the various careers in the marketing and advertising field! Students DISCOVER various careers and ASSESS skills needed to succeed in the field as well as INVESTIGATE technology tools often used in marketing. Check out the other marketing products that can be BOTH digital OR printables! Marketing case study on CANDY ENTREPRENEURS!